Born and raised in Whitwell, Derbyshire. Nearest town Worksop, Notts and nearest city Sheffield. Robin Hood and Peak District country! I moved to Swindon from a part of the country still ravaged from the legacy of MT and the miners’ strike. Coming here from that was truly like coming to the land of milk and honey. You’ve no idea. Hence to a large extent my fondness for and advocacy of Swindon and the decision to create this Swindon blog. You can find me on Twitter @Anjelica1956 and Instagram amaatk123. Hi my name is David Foster. This is a brief resume, regarding the article on state of the old Canal bridge Milton Rd, and the building on it. Further to my previous message regarding the bridge and the building adjacent to it in 1965, the building I believe was a law court earlier, and before that it must have been some sort of warehouse for canal traffic, because there were lifting chains which protruded out over what was the Canal, it must have been empty for some time, until a chap by the name of Mike Smith took over the lease, it then became known as the New Yorker Discotheque. I had my own window cleaning business in the town, starte by an old friend Tom Beale, from the Beales Cafe fame at the bottom of Fleming Way then, it was here I met Mike Smith a fruit machine operator, who’s business was at the cross roads of Station rd and Manchester rd, I did various jobs for him like collections from pubs, clubs, cafés. He mentioned one day that he was going to start a club in a building on Milton rd bridge, and would I be interested in running the coffee bar, those days you couldn’t get a drinks license where customers were under 21, and the type of clientele would be well under this age. But there was a catch I would have to run the Cafe in havelock street as well, on a fifty fifty basis, in those days I was always looking to make something from somewhere, I accepted and so our partnership took off. While the Discotheque was being developed and painted I carried on with my own thing, it wasn’t until he told me the decorations were finished and I should have a look, to my amazement the dance hall had been decorated to resemble a New York street scene on all four walls, and when the fluorescent lights were turned on it was just just like walking on the side walk, I had never seen anything like it. The first night opened with the local band and Justin Hayward singing, not long after he moved on to be the front man for the Moody Blues fame, like nights in white Satin and many other songs, the first night didn’t do that well but within a week we were pulling in 200 and more, the word was out, we doing good business in the coffee bar as well, we’d order crates and crates of Pepsi, Coke and Fanta, and sometimes have to get extra deliveries. As time went on we had better groups like, Geno Washington, The Cream, Fleetwood Mac, Chris Farlowe, and the list would go on, one night there were so many in the building we had to close the doors it became that popular, as time went on Havelock street had a compulsory purchase order placed on most of, to make way for the new shopping centre. The disco had been going for 3 years and it came into direct competition with the Brunel Rooms. I left in 1968 and took over another cafe in Calne. This stirred a memory that I had completely forgotten. I was a student at the Art School at The College in 1965, and somehow a friend and I helped paint the night club walls (mentioned above). We mixed washing powder (I think it was Daz) with the dark blue ‘sky’ paint and when the black lights were turned on, it sparkled. (As many will remember, those black lights were notorious for highlighting the glow from underwear, shining through top clothes, and the dandruff on many a boys’ shoulders. Neither were pretty sights…. Oh thanks Zoe. It’s only a couple of clicks. Grange Park eh? And your partner from Shirebrook. SUCH a small world! Hi, I’ve just come across your blog after looking for some historical (well, late ’80s early ’90s… hardly historical!) photos of my hometown. What a coincidence – my partner is from Shirebrook, not far from Whitwell! We now live abroad and he really misses Swindon, even though he only lived there with me a short while. 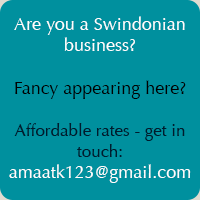 Angela – aka – Born again Swindonian. Will do Angela – also, I’m from Grange Park – my parents still live there. Great blog. Thanks for being so positive about Swindon (so many aren’t). Have you thought about joining Twitter? Good way of keeping in touch (both ways) with other people being positive about our town. Thank you for your mind comment. I am on Twitter actually. @Anjelica1956 so you can find me on there. But please do follow the blog also. 🙂 Cheers!